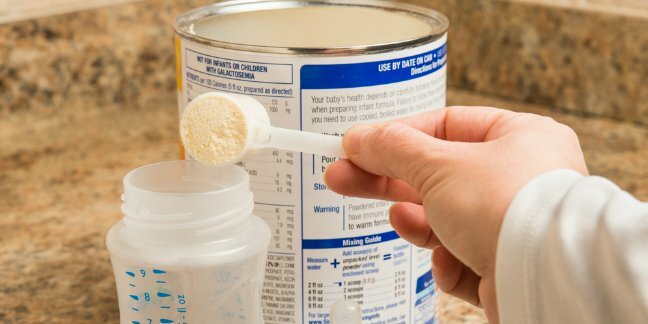 Making Homemade Baby Formula – Are there recipes for homemade formula? Is it safe to make homemade infant formulas? While there have been many recipes for homemade infant formulas floating around the internet, wholesomebabyfood.com will not post these recipes. I caution that you do not try to make your own homemade formula. This caution does not mean that I or anyone associated with Wholesome Baby Food.com is “anti-formula”! Quite the opposite – for the non-breastfeeding infant (also breastfed babies are supplemented with formula and the nutritional balance of formula is important), infant formula is baby’s main source of nutrition while solid foods are not. While burning or otherwise “messing up” a batch of sweet potatoes or applesauce would not have a severe impact on your little one’s nutrition and growth, improper mix of homemade formula might! Commercially prepared formulas are regulated by the Food and Drug Administration as a food for special dietary use. I have had a few visitors email to say that I should include homemade formula recipe(s) and not “fearmonger” about the negatives of homemade infant formula. It would be irresponsible of this site to make recommendations and/or offer recipes for homemade infant formula. Solid foods are known as complimentary foods because that is what they are, complimentary; they are not meant to provide for the total nutrition of an infant. Recipes for sweet potatoes and squash for example, will not endanger the overall nutritional health of your baby because your baby’s main source of nutrition is not coming from solid foods. A homemade formula recipe could very well harm the health and growth of a baby. During baby’s first year, infant formula is a non-breastfeeding baby’s main source of nutrition and may also be a complementary source of nutrition to a breastfed baby. We do not feel that it is wise to make homemade formula for this important reason. We will never post or endorse any recipe(s) that may endanger the health of an infant. If you wish to make homemade baby formula for your infant, you should be aware of all the possible nutritional implications. You should consult with your pediatrician and a pediatric nutritionist. You must be absolutely certain that the homemade baby formula that you make will not endanger the health and growth of your baby. This website is not backed by any commercial entity whatsoever. It does not receive funding from any infant formula maker or baby food maker.